It’s hard to talk about passing on the farm, but in the long run it’s better to talk about it and make preparations before something unexpected happens. 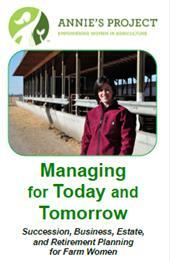 Farm women can play a key role in planning successful farm transitions. Annie’s Project is a nationally recognized educational program dedicated to fostering women’s roles in the modern farm enterprise. “Managing for Today and Tomorrow” is an Annie’s Project course geared for farm women of all ages who want to plan now for a successful transition later. Penn State Extension along with AgChoice Farm Credit, PAFarm Link, and Pennsylvania Women in Agriculture Network are pleased to offer “Annie’s Project: Managing for Today and Tomorrow”, a course on farm succession planning in Corry, Erie County Tuesday evenings March 1, 8, 15, 22, and 29, 2016 from 5 to 9 pm at the Corry Higher Education Council located at 221 North Center Street, Corry, PA. The five-session course includes hands-on activities, relevant educational materials, and the opportunity to interact with local professionals in succession planning, estate planning, retirement planning, and business planning. Participants of all ages and experience levels will practice tasks to increase confidence in setting goals, nurturing effective family conversations, and defining the farm legacy. Annie’s Project courses provide an opportunity for dialogue and networking with fellow farm women. The cost of the program is $125 per person. Pre-registration is required online or by calling 814-563-9388. The registration deadline is Thursday, February 18. For more information please contact Juliette Enfield, Penn State Extension – Warren County at 814-563-9388 or jse15@psu.edu.